Farmville, Mob Wars, Mafia Wars, Food Fight!, My Quizzes, Super Quiz Deluxe, The Magic Tickle Monster… What do these things all have in common? They’re all popular Facebook Applications. Okay, maybe I made that last one up. At one point or another we’ve all been asked to take a quiz, play a game, contribute to someones farm, or help a lost sheep find a new home. But did you know that most of these popular applications are 3rd party applications, in which Facebook has no control over their content? Facebook Applications Are Dangerous! The Facebook application process starts when a person such as myself, a business, a felon, or other living-with-his-mother basement dweller gets the bright idea to create a “Which Harry Potter Character are you?” quiz. They navigate to developer.facebook.com and sign up to become a developer. Information gathered is minimal. They don’t need to pass a background check, be an actual company, or be in the United States. If I recall correctly (and admittedly, I may not) all that is required is what is already in your Facebook profile. Once an application is written, Facebook does not review it’s source code or in depth content. Whether it is profanity-riddled, full of bugs, or chock full of advertisements, Facebook does very little to review an application. Your application is briefly reviewed for content when it is listed in the Facebook Application Directory. One of the biggest motivators for writing a Facebook application (Aside from wanting to share your amazing quiz with the world, of course) is that you gain incredible access to peoples private Profiles. By default, Facebook developers can access all of your status updates, comments, your links, your posts, your photos, your friends list, your name, your birth date, your hobbies, your religion, and virtually anything else that you have listed in your profile. A few of the things that aren’t open by default: E-mail address, phone number. Facebook Developers can save and store all of the information collected in their own database. Or, in their basement, on CD’s, in a laptop bag left on a bus, or virtually anywhere else they want. Once you’ve authorized an application, they can permanently store your information off site, away from Facebook, anywhere they want. Including their home. Despite what the URL indicates at the top of the page, Facebook applications are loaded from different websites. Developers most provide their own web site hosting and bandwidth for their Facebook application. When someone accesses an application, Facebook will actually go and access that website, and provide content to the Facebook user directly. In other words, Facebook is a proxy for other websites. But the process is transparent. Most applications appear to be coming from Facebook, when 90% of the time Facebook has gone to the developers website, grabbed their content and files, and served them to the Facebook user. Do you see the problem here? A Facebook developer can easily embed malicious Spyware or viruses into their Facebook application. Facebook then retrieves those malicious items when it retrieves the rest of the Application, and unknowingly provides them to the user. I’m glad you asked! First and foremost, don’t use Facebook applications! But if you’re like most people, that answer simply isn’t good enough. Don’t approve every application that presents itself – research it first! 2. Check out an Application’s Page and wall to see what other people are saying. Click on the name of the application (To the left of the Star rating, above). If an application has negative reviews, ratings, or wall comments… Stay away! It’s not worth it! You’re Dumbledore, I swear! Keep your friends from giving away your information! Let’s say you read this article and decided to stop using Facebook applications all together. You’re safe now, right? Wrong! If your friend authorizes an application that you have refused to use, Facebook will give that application all of your information, along with every other friend your friend has! In other words, one indiscriminate friend can easily give away every one of his friends private information by simply authorizing an application. 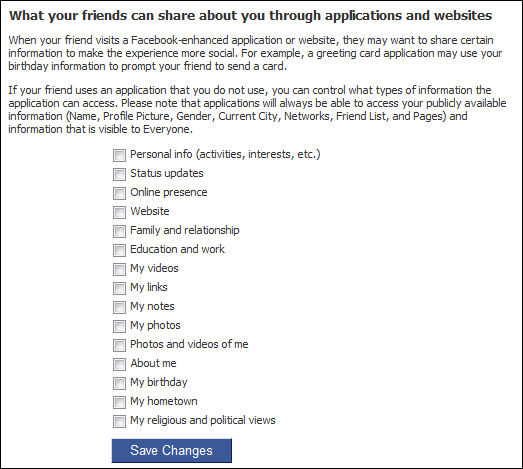 To stop it, limit what information Facebook gives to applications your friends use. 3. Remove the check from every checkbox listed, and click save! Now, even if your friends don’t care as much as you do, they still wont’ be able to sell you out like they have been. Aside from avoiding Facebook 3rd party applications all together, this is about all the information I can muster on protecting yourself. Have any additional information? Please comment! This entry was posted in Technology. on February 25, 2010 by I'm a Super .com.